Special shape bow-tie pasta. 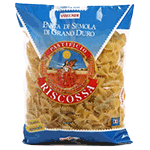 Be prepared to try all the available special shapes of pasta Riscossa. Very fast to be prepared and always able to meet your authentic needs. Cooking time 8 minutes. Product of Italy.